Alphabet/Google announced first quarter financial results that beat Wall Street analyst estimates. But the jump in revenues hides a large problem. The Google core business is, as usual, quite boringly efficient. We tend to see the same story every quarter — the value of each ad (cost-per-click) goes down while the number of ad impressions goes up, and Google makes a ton of money in the process. 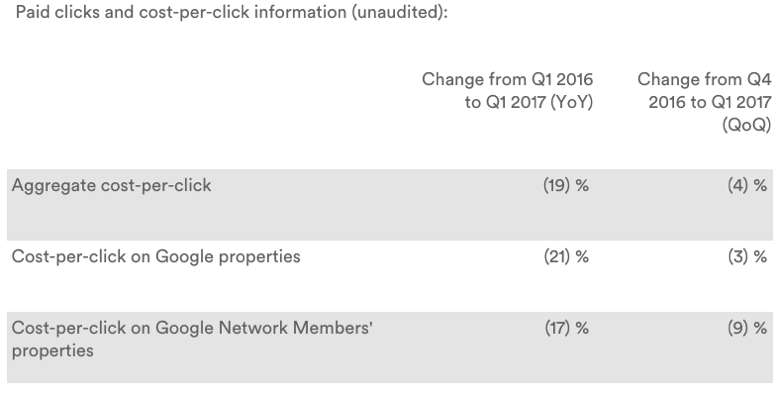 Google is incredibly bad at creating ad value — it is forced to grow revenues by chasing quantity over quality. Alphabet/Google is making huge profits but all web users lose because to make money Google has to find new ways of grabbing attention for less effective ads. The tens of thousands of the world’s top computer engineers employed at Google have quarter-after-quarter failed to reverse this loss in ad value. Instead Google distracts the curious by pointing to self-driving cars and “moon-shots” that have nothing to do with its core business. This loss of ad value hasn’t harmed Google’s profits but it greatly affects the media industry which faces high content production costs. Wasting people’s time on ever larger numbers of ineffective ads is not a sustainable business strategy — and it is unethical, imho. Yet this is the only way this company knows how to drive revenues. Look over there — that car is driving itself! With a ransom malware epidemic and suspiciously fake content everywhere — added to an expanding universe of trillions of crappy ads — the web experience feels ever more corrupt and icky than sticky. And watch what you touch — even hyperlinks from friends are suspicious. If you can’t trust the hyperlink there is no web (and no Google). As the web experience becomes less appealing people will likely rediscover the delights of a simple walk along a street or in a park — experiencing the high-definition multi-sense reality of reality. No ad blocker needed. But watch where you step.